Preheat oven to 180C. In a pan heat the soup, water, lemon juice, mayonnaise & curry powder until smooth. 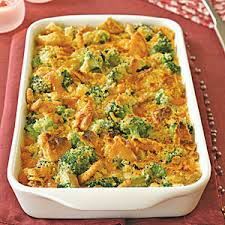 Layer the chicken and broccoli in a shallow baking dish and pour the soup mix over. Grate cheddar cheese over the top. Bake for 35-45 mins until bubbly.